Deck the halls with boughs of holly...and delicious desserts, of course. Just because the chocolate chip cookies are reserved for the reindeer doesn’t mean you can’t get your fair share of holiday treats this season. I collaborated with food blogger Angelica Arias to bring you seven December-themed dessert recipes that are both delectable and nutritious. Sorry, Santa—these are all yours. 2. In a large bowl, mix all dry ingredients except chocolate chips, almond flour, tapioca flour, coconut flour, cacao powder, coconut sugar, baking powder, and salt. 3. Whisk 2 eggs together. 4. Add coconut oil to dry ingredients and mix well using your hand. 5. Add milk and eggs and make sure all ingredients are well-mixed into a dough. 6. Mix in peppermint extract. 7. Roll your dough into a ball and pat down into a 7-8 inch disc. 8. Line baking sheet with parchment paper and place dough on it. 9. Slice your dough into four halves to make eight scones. 10. Whisk remaining egg and brush over the top of scones. 11. Bake for 22 minutes. 12. Using a spatula, carefully separate and turn scones to have points pointing out. 13. Bake for another 8 minutes. 14. Once scones are done, allow them to cool for a few minutes. 15. While scones are cooling, in a small saucepan, melt coconut oil on low heat. Then add chocolate chips until melted. 16. Using a spoon, drizzle glaze over each scone. 17. In a food processor, pulse coconut flakes, freeze-dried strawberries, and peppermint extract. 18. Sprinkle as much as you would like to the top of glazed scones. You will have some leftover. In comparison to white flour, the almond flour used in this recipe is gluten-free, low in carbohydrates, high in fiber, and rich in protein. This type of flour also provides a significant amount of calcium, which helps improve heart health and lower cholesterol. Additionally, the peppermint extract used has a variety of health benefits that date back to early Greek and Roman cultures. Back then, it helped remedy a variety of conditions and today, we rely on the ingredient to reduce pain and increase antioxidant intake. 2. In a large bowl, mix dry ingredients: almond flour, tapioca flour, baking powder, and salt. 3. In a separate bowl, mix wet ingredients: coconut oil, orange juice, eggs, maple syrup, and vanilla extract. 4. Pour wet ingredients into dry ones and mix well. 5. Mix in orange zest and then fold in cranberries and walnuts. 6. Line a 10 x 5 bread baking pan with parchment paper and pour batter in. 7. Add a few orange slices to the top and a few cranberries for garnish if desired. 8. Bake for 35 minutes. Allow to cool off for 10 minutes. 9. Grab parchment paper from the sides and take bread out of the pan. Oranges are a great source of both soluble and insoluble fiber, which help prevent stomach and intestinal issues such as irritable bowel syndrome. This fruit can also enhance physical appearance, as the natural oils inside of them keep skin looking fresh and radiant. 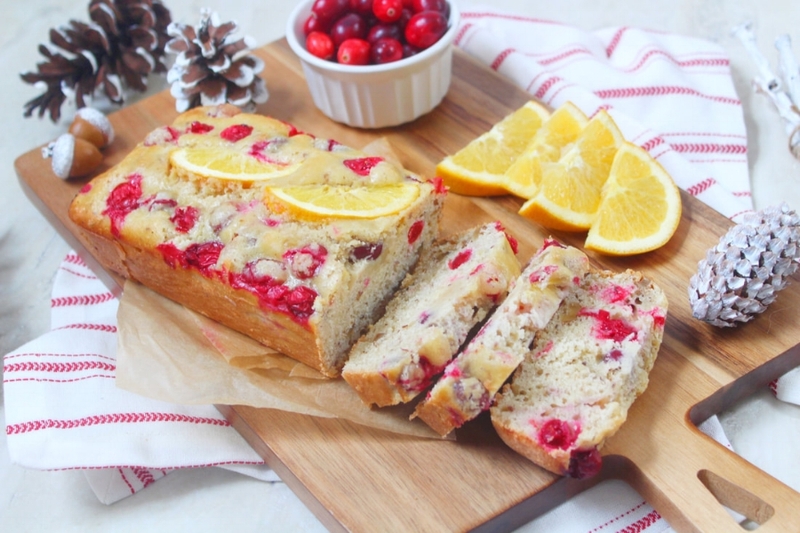 Often referred to as a superfood, cranberries also offer nutritional value to this recipe. They are high in antioxidants, low in calories, and have even been proven to lower the risk of getting certain types of cancer. 2. In a large bowl, mix all dry ingredients: almond flour, tapioca flour, sugar, ginger, cinnamon, nutmeg, cloves, and salt. 3. Add coconut oil and mix in using your hands. Make sure all dry ingredients are coated in coconut oil. 4. Whisk eggs and mix in. 6. Divide dough into two equal parts and roll into logs. 7. Line a baking sheet with parchment paper and place both logs on it. 9. Remove from oven and allow to cool off a bit. 10. Slice baked dough diagonally, about ¾ inches wide. 11. Lay each biscotti on the side and bake for another 10 minutes. 12. Remove and allow to cool. Ginger has been a key ingredient in Chinese medicine for over two thousand years, as it is extremely helpful in curing and preventing health issues. It also promotes energy circulation in the body and increases one’s metabolism. The coconut oil used for the biscotti serves a similar purpose—it contains triglycerides that have been proven to increase calories burned over the course of a day. Additionally, the oil boosts digestion, improves immunity, and raises the “good” HDL cholesterol. 2. In a large bowl, mix dry ingredients: tapioca flour, coconut flour, coconut sugar, matcha powder, baking powder, and salt. 3. In a separate bowl, mix wet ingredients: coconut oil, eggs, coconut milk, and vanilla extract. 5. Line baking sheet with parchment paper. 6. Scoop a handful of dough and roll into a 2.5-inch cookie. Place on baking sheet. 6. Repeat until all dough has been rolled into cookies. 7. Bake for 12 minutes. 8. Mix all ingredients for hearts and place in a small sandwich bag. Cut small tip off. 9. You can either make small hearts on each cookie freehand or use a heart shaped cookie cutter and fill the inside. You can also leave cookies as is. Matcha powder—which is used to tint the cookies green—not only calms the mind but is rich in antioxidants such as EGCg that neutralize free radicals inside the body. The powder also boosts metabolism, helps regulate blood sugar, and protects against heart disease. The Greek yogurt used for the hearts, as opposed to regular yogurt, is much higher in protein and lower in sugar. Greek yogurt contains probiotics as well, which can help boost immunity and prevent stomach problems. 1. Mix all ingredients for eggnog in a blender. 2. Pour into a small saucepan and bring to low heat. 3. Lightly simmer for 10 minutes and stir occasionally. 4. Remove from stove top and allow to cool. Once it has completely cooled, refrigerate for a few hours until chilled. 5. Preheat oven to 400 degrees Fahrenheit. 6. In a large bowl, mix all dry ingredients: almond flour, tapioca flour, coconut flour, salt, baking powder, cinnamon, and nutmeg. 7. Whisk egg and add to mixture. 8. Add eggnog and vanilla extract and mix well. 9. Line baking sheet with parchment paper. 10. Scoop dough and roll into 1.5-inch cookies. Repeat until all dough has been rolled into cookies. Why They’re Healthy: Eggnog is made with milk, so it’s rich in calcium, phosphorus, and vitamins A and D. It’s also packed with magnesium, which helps regulate energy levels and sustain the wellness of your blood vessels and heart. Additionally, in this recipe, coconut sugar is used instead of white sugar. Coconut sugar is naturally made from coconut palm sap, therefore, it contains lots of significant nutrients found in the palm: iron, calcium, potassium, polyphenols, and antioxidants. It even contains a fiber called inulin that slows glucose absorption and promotes digestive health. 2. In a large bowl, mix dry ingredients: tapioca flour, almond flour, coconut flour, salt, baking powder, and baking soda. 3. In a separate bowl, mix wet ingredients; coconut milk, eggs, vanilla extract, and coconut oil. 5. Grease a 9 x 9 baking pan and pour batter into it. Move the pan around to even batter out on every side. 7. Allow brownies to cool. Turn baking pan upside down and remove a brownie from it. 8. Turn brownie over and cut lengthwise into thirds. 9. Take the first third of brownie and place the knife at the top left corner. Cut down diagonally. Place knife at the point of the line that was just sliced and cut diagonally opposite way. This should make a triangle. Continue cutting from point to point making triangles. You will have corners leftover on each side which you can set aside. 10. You may stick popsicle sticks at the bottom of each tree or candy canes or leave as is. 11. Mix plain Greek yogurt, maple syrup, and matcha. Place in a small sandwich bag and cut a small hole in the tip. 13. Carefully make swirls from side to side going down on each Christmas tree. 14. Place chocolate-covered sunflower seeds or a candy of choice down the green swirls. 15. Serve immediately or store in the fridge for up to three days. The dark chocolate chips that flavor the brownies are healthier compared to other types of chocolate due to their high concentration of cacao. Dark chocolate has lots of flavonoids and antioxidants, which can help strengthen blood vessels, lower cholesterol, and reduce blood pressure. The Greek yogurt—used for the tree decoration—is strained so that the whey is filtered out and only thick cream remains. As a result, the yogurt is more concentrated, so it contains a significant amount of protein that is essential for bone health. 1. In a small saucepan, melt coconut oil on low heat. 2. Add chocolate chips and stir until they have melted, making a chocolate sauce. 3. Line a 9 x 9 baking sheet with parchment paper, leaving some out on the sides. 4. Pour chocolate sauce and move the pan around, making sure it is evenly spread. 5. Allow to cool off for 5 minutes and freeze. 6. While chocolate sauce is freezing, mix plain Greek yogurt, maple syrup, and peppermint extract. Set aside. 7. In a food processor, pulse coconut flakes and freeze-dried strawberries until pulverized. 8. Remove chocolate sauce from the freezer and pour Greek yogurt over it. Use a spatula or table knife to spread evenly. 9. Sprinkle pulverized coconut flakes and freeze-dried strawberries over yogurt. 10. Place back in the freezer for at least 2 hours. Peppermint is linked to numerous health benefits: it can ease indigestion, remedy the flu, and even protect against cancer. It is also beneficial in combating bloating, gas, pain, and other symptoms of irritable bowel syndrome. Used in combination with maple syrup, which contains numerous antioxidants and helps fight inflammatory diseases, the nutritional benefits are endless. If you try out any of the recipes, make sure to post a picture on social media and tag @carrieberkk @thepeacheepear #carrieschronicles for the chance to have your photo featured on our social media!